The new Estrella upholstered bed is stylish yet discreet. It represents a successful symbiosis of the classical wooden bed and upholstered bed that appeals through the lightness and timelessness of its design. Estrella can be combined with all Hüsler Nest sleeping systems. To ensure that the Estrella bed lives up to its name, we use only the finest, highest-quality fabrics. Textiles in a variety of different weaves and leathers in a choice of finishes make every bed a unique creation. Choose from a wide selection of supports and skids to further individualise your Estrella bed. 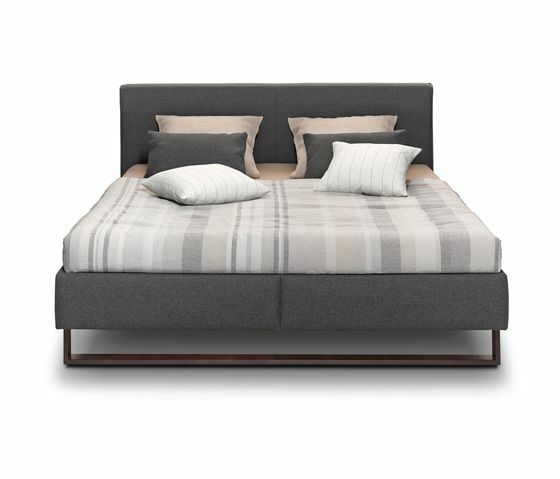 The headboard is available in floor-level and off-floor versions.